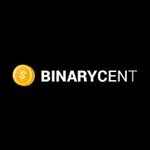 BinaryCent, Trade Binary Options for as Little as $0.1. BinaryCent offers a good bonus programme on deposits though x20 trading turnover of deposit is a somewhat onerous condition. This broker’s proprietary trading platform’s minimalist simplicity will appeal to beginners and technophobes and offers a very usable stripped-back trading experience. Live video feed chat constantly available in several languages leads to a particularly good score for customer support and the broker provides a health range of over 100 tradable assets including 11 cryptocurrencies. The first step to entering the accessible, innovative, risk-controlled financial markets trading environment that is binary options trading, is settling upon a broker to work with. Even traders who have been in the market for some time would be best advised to keep their eye on other good brokers out there to ensure that they are getting the best product, service and deal available to them. And there are quite a number to choose from. The recent surge in the popularity of trading binary options has led to a parallel surge in the number of companies offering brokerage services and a trading platform. Competition levels have boosted average standards across the industry, which can only be a positive for traders, but there is still a range of quality out there, not least when it comes to the softer arts of customer service and security of client funds. We’ve taken the time to go through a significant number of the binary options brokers currently on the market to assess how they perform on key qualities such as trading platform technologies, pricing, banking, security and customer service. We sincerely hope that you find this resource as valuable as we intend it to be when it comes to saving individual traders research time! 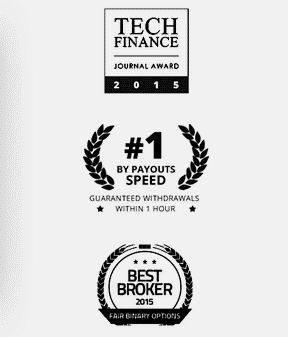 Here we cover BinaryCent, voted Best Broker 2015 by industry media and watchdog Fair Binary Options. BinaryCent is one of the more recent binary options brokers to come to the market having launched in 2015. The company is owned and operated by Finance Group Corp., and has its registered address in Vanuatu, a South Pacific tax haven. While not being registered in a more familiar location might often be cause for trepidation among traders and a red flag, this does not appear to be the case for BinaryCent. The brokerage has quickly grown in popularity since its launch a couple of years ago and has won numerous awards. If there is one quality that speaks loudest with regards the security of a broker it is how quickly and smoothly withdrawals can be made from a funded trading account and BinaryCent has made its mission being the best in this regard. Withdrawals are guaranteed to be processed within 1-hour, against a 3 to 5-day industry average, a record that makes BinaryCent the fastest broker in the industry for withdrawals. As mentioned in the intro, the broker was also awarded the 2015 Best Broker gong by industry media and watchdog Fair Binary Options and its blog garnered the 2015 Journal Award bestowed by Tech Finance. BinaryCent sets itself apart from its peers by offering what are arguably the lowest financial barrier-to-entry trading conditions currently available on the market, with a minimum deposit requirement of just $100 and minimum trade stakes as low as $0.10. 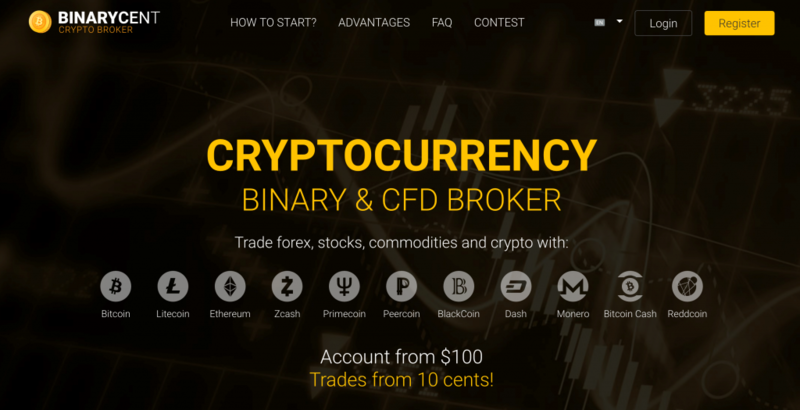 These super low-cost trading conditions position BinaryCent as an entry broker for beginners to binary options trading. BinaryCent has taken the brave step of developing and running its own proprietary binary options trading platform rather than going down the route of using white label software powered by one of the big 3rd party platform providers. Positioning itself as the ultimate broker for beginners on pricing, the trading platform follows the same trend. 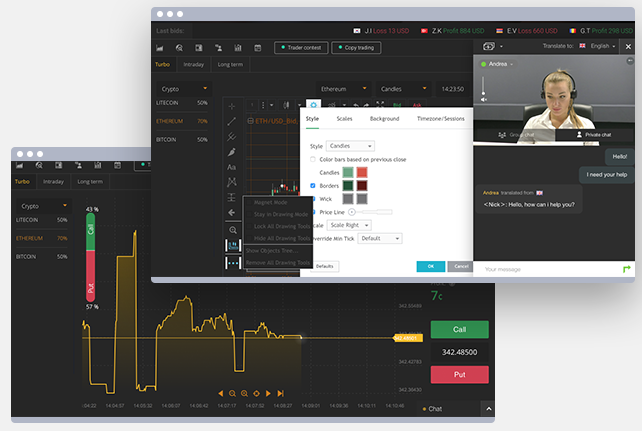 Its minimalist approach has stripped back binary options trading and even the most tech-phobic will quickly get to grips with its simple and well laid out functionality which focuses on trading without the bells and whistles. A key feature to BinaryCent’s trading software is the constant presence of a live representative providing support, though not trading advice, on placing and managing trades. While more advanced traders may look for more advanced features and tools than are available on the BinaryCent platform, the stripped-back simplicity will appeal hugely to beginner traders or those who prefer a trading platform to be a trading platform and to use other sources for things like charting and analysis. The minimalist nature of the BinaryCent trading platform makes its conversion to mobile app format almost seamless. 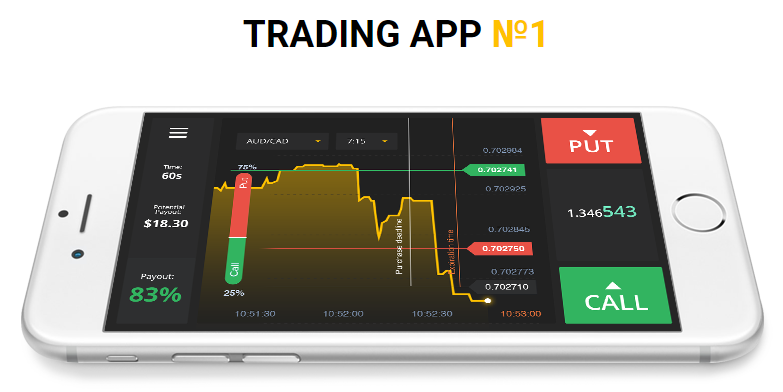 Other than some minor tweaks, mainly to dimensions and around the live customer support window, traders will find little difference between the mobile app and desktop format of the platform. The app is downloadable at no charge in native Android and iOS versions from the Play Store and App Store respectively. BinaryCent’s platform gives traders access to a little over 100 different tradable assets which is above the industry average. Forex pairs, individual stocks and indices are all available. While gold and precious metals indices can be traded one chink in the broker’s armour is the fact that stand-alone commodities are not an asset class available to be traded. One asset class that BinaryCent excels in that few other binary options brokers can compete with them on is the availability of several cryptocurrencies that can be traded. In fact, not only can traders using BinaryCent take out options on cryptocurrency price movement, trading accounts can be denominated in 11 different cryptos as their base currency! Quotes on tradable assets are provided by Thomson Reuters. BinaryCent, in keeping with its ‘keep it simple’ approach offers traders classic high/low binary options and additionally only Turbo and Long Term options. Turbo and Long Term Options keep the same basic format but have, in the case of the former, a short timeframe of up to a few minutes, and, for the latter, a longer timeframe of up to a couple of months. More experienced binary options traders may have become accustomed to seeing brokers offer a wider range of binary option formats such as One Touch and Ladder binaries. However, the reality is that around 95% on trades are made on classic binary options or shorter and longer-term options that stick to the high/low principle. The lack of additional formats may be considered a deficiency for some but the vast majority, particularly BinaryCent’s main target of beginners, will not consider this a loss. No additional fees are charged either for ‘administration’ of dormant accounts or for withdrawals but traders do cover transfer fees on deposits and withdrawals. These will vary depending upon the payment processing choice of the trader and it is their responsibility to inform themselves on what fees may be applied to their favoured payment method. Any profits made as a result of use of the bonus can be cancelled at the discretion of BinaryCent. Traders can decline bonuses at their own discretion if they do not wish to be tied to its turnover terms. Both withdrawals and deposits can be made via a range of different payment methods including debit and credit cards and an impressive selection of e-payment processors. One downside is that bank wire transfers are not supported but to balance things out BinaryCent supports deposits and withdrawals via 15 crypto and alt digital currencies. The minimum account deposit is set at just $100, appealing against an industry standard of $250. The minimum withdrawal from a trading account is set at $50 and withdrawals are aimed to be processed within 1 hour, though the terms and conditions bind the broker to a 10-day window. BinaryCent focuses its customer support on the live chat with video link box that is a prominent on all areas of the broker’s website and within the trading platform. Support is available in English, French, Dutch, Spanish, German, Portuguese, Arabic, Thai and Mandarin. Telephone and email support is also provided. One-to-one mentorship with a trading professional is one of the flagship resources that BinaryCent provides, though this is limited to traders who have made larger deposits. Another additional feature of the trading platform is the social trading functionality that allows traders to ‘mirror-trade’ the most successful traders on the platform by replicating their positions. Traders can, however, adjust the stake size to be more or less than that of the trader being mirrored. The stripped-down, minimalist trading platform, $100 initial deposit requirement and $0.10 minimum trade stake means that BinaryCent will inevitably appeal most to less experienced traders. However, in saying that these qualities will also appeal to a certain segment of more seasoned traders who prefer simplicity and low stakes. The offshore domicile of the broker may be off-putting for some but the awards BinaryCent has been scooping up over the past couple of years since being founded as well as the standard-setting withdrawals processing times should allay most concerns. A good, if simplified, trading experience, a healthy range of tradable assets, cryptocurrency early adoption both in terms of payments processing and tradable instruments and micro stake sizes all offer significant appeal. What is the minimum investment stake available with BinaryCent? The minimum investment stake for trading with BinaryCent is $0.1. What is BinaryCent’s minimum deposit? The minimum deposit required to open an account with BinaryCent is $100. How long does it take BinaryCent to process withdrawals? BinaryCent’s stated withdrawals processing target is 1 hour though terms and conditions state up to 10 days. Do BinaryCent offer cryptocurrency trading? Yes, 11 different cryptocurrencies can be traded as binary options. Can I trade on BinaryCent with a cryptocurrency account? Yes, 15 different crypto and alt currencies are supported as base currencies of a trading account with BinaryCent.